Yesterday, Gwyneth Paltrow took to Instagram to share a rare photo of her and Chris Martin’s daughter, Apple. Paltrow tends not to share photos of her two children, Apple and Moses, however on this rare occasion she posted a recent shot of Apple and people keep saying the same ol’ thing. But before we get to that, allow me to explain why Paltrow was so keen to share the lovely photo. Simple really. It was her 14th birthday. 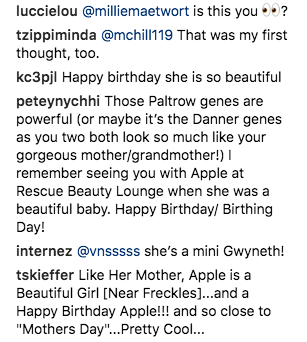 The night before Apple’s big day, which coincidentally was also Mother’s Day, Gwyneth posted an intimate photo of herself shortly before she gave birth to her only daughter 14 years ago. Just a matter of hours after posting the above snap, Paltrow posted the picture of her daughter Apple – and everybody is commenting the same thing. That mother and daughter look almost identical, It’s not hard to see. In the photo she gives a windswept stare into the camera into the camera – on what appears the be a beach. Happy birthday, my darling girl. You make everyday feel like Christmas morning. You are the most vibrant, hilarious, twirling all over the place, beautiful (inside and out) young woman. You are an amazing thinker and an incredible songwriter. Thanks for still hanging out with me, even though you are 14. Those Paltrow genes are powerful (or maybe it’s the Danner genes as you two both look so much like your gorgeous mother/grandmother!) I remember seeing you with Apple at Rescue Beauty Lounge when she was a beautiful baby. Happy Birthday/ Birthing Day! Apple was born in 2004, the first child of Paltrow and Chris Martin, followed two years later when the admission of Moses into the world. Paltrow and Martin were married in 2003 and remained together up until 2014 when they separated – getting officially divorced in 2016. However rumour has it that Paltrow may be tying the not with her current love interest, Brad Falchuk, after they held a seemingly random lavish party in LA last month. Paltrow made headlines recently after she revealed a spoiler to the highly anticipated Avengers 4. The relationship between her and Robert Downey Jr’s characters has been one of longest in the Marvel Cinematic Universe, beginning in the first Iron Man film 10 years ago. The CEO of Disney later confirmed Avengers 4 might not be the last we’re likely to see, which means we might be able to see the growth of the pair’s apparent child. Happy birthday, my darling girl.